Bronzer's contain either natural pigments or dihydroxyacetone (DHA). Natural pigments work with the skins color and produces an instant darker color. DHA is an amino acid, and it comes from sugar cane. It is a safe effective way to darken the skin. You should wait 4-6 hours after UV exposure to shower. Both of these bronzers work at the top layer of the skin to alter the color. 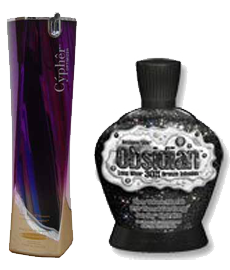 These give you a darker tan in less time and with less exposure of sunlight.